Our aim is safer space for cycling and you can help by emailing issues (with photos if available) to southwark@lcc.org.uk . 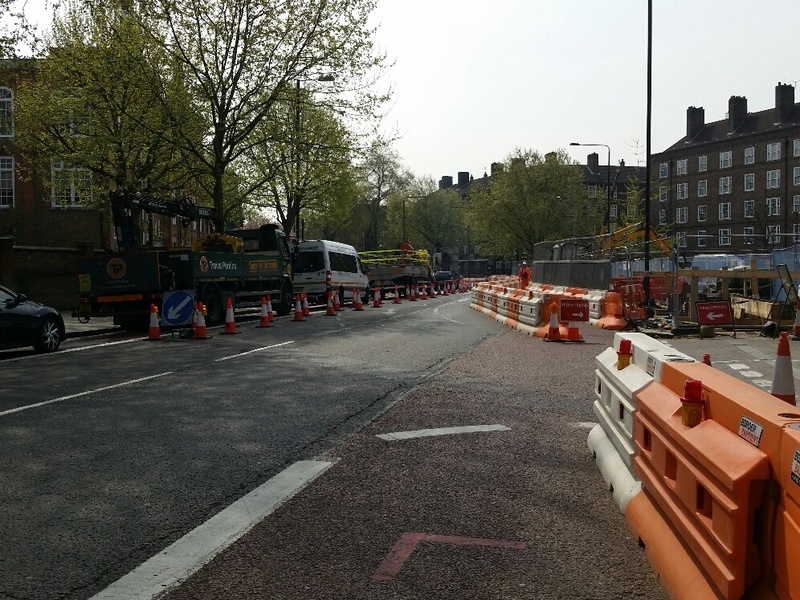 The number of road changes going on in London is huge, with any one scheme going through many phases of on-site changes, with different continually changing temporary road layouts. One lorry, or bus, can knock structures and make a previously safe area unsafe for cyclists. You may be the first to see this. A small group of Southwark and Lambeth cyclists met up with a TfL road works traffic management engineer on Thursday morning and rode through Blackfriars Rd, Elephant and Castle, the Oval junctions, Kennington Road and Harleyford Road. We noted issues and took photos with the TfL engineer. We saw some potentially dangerous schemes and discussed with the engineer measures that could improve them. Some changes were implemented on the day. We will repeat the exercise over the coming weeks. We hope that those involved in road works traffic management, e.g. contractors and on site managers, will gain a better understanding of cycle specific dangers, and guard against them. TfL also are keen to learn. We can help them with our experience and knowledge. We can let them see through our eyes and learn through our experiences. Please keep us updated with your *pictures* – we need road name, direction and a short line on the issue PLEASE!! Especially when there’s been a sudden change. Due to the rapid changes of some layouts, a picture is strongly requested.